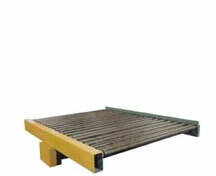 Products are sometimes too wide to convey inside the conveyor. 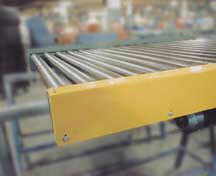 With Chain Roller conveyors, however, the chain guard extends above the top of the rollers and prevents any overhang. On the Model 25-CRR, the chain guard extends 1-5/8 in. above the top of the rollers. This Model 25-CRR was designed with the chain guard in a "low profile." The rollers extend above the chain guard 1/16 in. This allows for product overhang.